Democrats have united behind a bid to derail the district court nomination of a judge who defended a racially gerrymandered House map in North Carolina and helped draft the state’s voter ID law, efforts that federal courts found were specifically designed to disenfranchise African-American voters, in one case, “with almost surgical precision”…. “It is no exaggeration to say that had the White House deliberately sought to identify an attorney in North Carolina with a more hostile record on African-American voting rights and workers’ rights than Thomas Farr, it could hardly have done so,” the Congressional Black Caucus wrote to the Judiciary Committee. Thomas Farr needs to withdraw his nomination immediately. 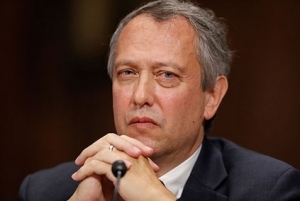 We’ve always known Thomas Farr as the architect of the worst voter suppression law in the country. However, we have now found that he was more deeply engaged than anyone knew in intimidating Black voters during not one, but two of Jesse Helms’ campaigns for U.S. Senate. North Carolina NAACP leader T. Anthony Spearman is leading a delegation to Washington today. The group issued a statement from former U.S. Senate candidate Harvey Gantt opposing the nomination. The Lawyers’ Committee for Civil Rights Under Law issued the following statement on the nomination of District Court nominee Thomas Farr. The statement followed new revelations yielded from a 1991 memorandum from the U.S. Justice Department regarding Farr’s role in schemes targeting African American voters dating back as far as 1984. I have known Tom Farr for nearly twenty years, Tom is the most thoughtful, honest and fair judicial nominee you will ever meet. The liberal LIES and character assassination of Mr. Farr is inexcusable and should not be tolerated. This action is very similar to what the liberal democrats did to Justice Kavanaugh. When a democrat lawyer defends a criminal, murderer or other crimes, why don’t the liberals criticize the democrat lawyer for doing his/her job of representing the client? Or is it only because Tom Farr is a constitutional conservative?